"I don&apos;t care how bad the earpiece is, Ku Klux Klan comes through pretty clearly," the Florida Republican told a crowd gathered in a hangar at the Knoxville airport Monday morning. That was in response to Trump&apos;s attempt to explain didn&apos;t clearly rebuke the KKK and other groups during a Sunday interview on CNN. "I&apos;m sitting in a house in Florida, with a very bad earpiece that they gave me, and you could hardly hear what he was saying," Trump said Monday on NBC&apos;s Today Show . "What I heard was &apos;various groups.&apos; And I don&apos;t mind disavowing anybody, and I disavowed David Duke." On Monday, the super PAC supporting Rubio, Conservative Solutions PAC, unveiled a new TV spot featuring Trump&apos;s CNN interview. The group said the spot would run in March primary states. Rubio also told the crowd that Trump should make apparel bearing the "Donald J. Trump" label in America, in response to Trump&apos;s attacks about trade. "If he was interested in bringing back American jobs, he could start this very morning by announcing that every product that says Donald Trump on it will be made in America. 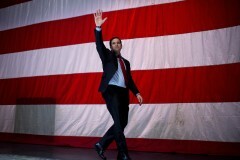 I challenge him to do that," Rubio said. Gov. Bill Haslam and Sen. Lamar Alexander were both on hand to make pitches for Rubio. Alexander, something of a local legend in and around Knoxville, said in an interview with Roll Call that the the presidential contest needs to go all the to the final primaries and caucuses. "The stakes are too high to cut off the race before most people have had a chance to vote," Alexander said. "When most people have had a chance to vote, Donald Trump won&apos;t be the nominee. And he surely won&apos;t be the president of the United States. So, it&apos;s in the interest of our country and the party to let it run all the way through to the end." "You know, my advice would be to put the National Football League in charge of this," Alexander added. "You know, they don&apos;t put the Super Bowl at the beginning, they put the Super Bowl at the end," Alexander said. "We need to put our strongest player on the field in order to beat Hillary Clinton. That player will not be somebody who&apos;s insulted 70 percent of the American people on the way to the nomination." Rubio echoed the same theme on stage here. "If you want to president of the United States, you must love all of the American people, even the ones that don&apos;t love you back." Alexander said he did not know if the nomination Super Bowl would be played at the final primary or at the Republican National Convention in Cleveland. "That would suit me fine to let the people decide before we get to the convention. That would be the very last primary, but it surely shouldn&apos;t be decided in early March when only a small percentage of the American people have had their say," Alexander told Roll Call. The Rubio campaign was quick to react to Trump&apos;s statement on Sunday, circulating statements from lawmakers blasting the real estate developer for dodging questions about the KKK. "Any candidate who cannot immediately condemn a hate group like the KKK does not represent the Republican Party, and will not unite it. If Donald Trump can&apos;t take a stand against the KKK, we cannot trust him to stand up for America against Putin, Iran or ISIS," said Sen. Tim Scott, R-S.C., a Rubio supporter who is the only African-American Republican in the Senate. Separately, Nebraska Sen. Ben Sasse, who has not endorsed a presidential candidate, outlined in a posting on Facebook late Sunday evening why he could not support Trump as the Republican nominee. "Conservatives understand that all men are created equal and made in the image of God, but also that government must be limited so that fallen men do not wield too much power," Sasse wrote in an open letter to people supporting Trump. "A presidential candidate who boasts about what he&apos;ll do during his &apos;reign&apos; and refuses to condemn the KKK cannot lead a conservative movement in America." Related: Cruz and Rubio Playing for Second Place in the SEC Sessions First Senator to Endorse Trump Roll Call Race Ratings Map: Ratings for Every House and Senate Race in 2016 Get breaking news alerts and more from Roll Call in your inbox or on your iPhone.